Combine the beef, onion, garlic, almond flour, paprika, and salt in a large bowl. Using your hands, mix until just combined, being careful not to over mix. Form into 2-inch meatballs and lay on a baking sheet. Brush with the olive oil and coat with the Italian seasoning. Bake for 20-30 minutes, until cooked through. To make the greens, cook the bacon a large, deep skillet until it starts to brown. Add the greens and stir to coat in the fat. Add the broth or water to cover the greens and turn down to low. Let the greens simmer for about 10 minutes over low heat until greens are tender. 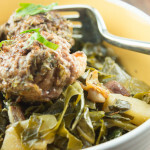 Serve the meatballs over the greens.